On Second Scoop: Ice Cream Reviews: Chick-fil-A Frozen Sunrise ...and why is it snowing? 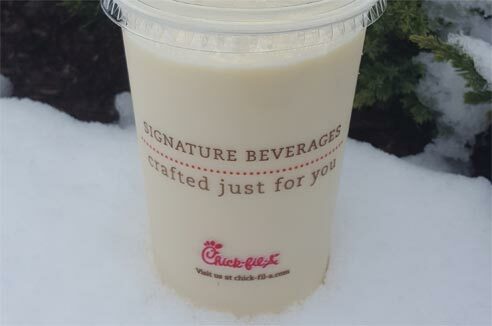 Chick-fil-A Frozen Sunrise ...and why is it snowing? When Chick-fil-A announced their frozen sunrise was going nationwide a month ago, I quickly put it on my to-do list. Now technically I'm not a huge creamsicle fan, but it seemed like a fun excuse to make one of my rogue trips to Chick-fil-a. Now I took this picture and you might notice the snow in the background. That's right, we got 2" of snow. Today. In April. After Easter. That's weird even for us New Englanders, but it does happen on occasion... Yes, I thought it would be funny to drink Frozen Sunshine in the falling frozen snow. I can be dumb like that. Anyway, I didn't like this. It wasn't like I spit it out, but I didn't get it at all. Actually, considering it tastes something akin to really cold orange juice and really cold milk spilled together, I should be surprised I didn't spit it out. I love OJ and I love milk, but if I poured milk in my OJ cup without rinsing it out, I wouldn't consider drinking it. I would go "ewwww" and then rinse it out and start over. So yeah, I didn't like it and regretted going with the large instead of the small. I was hoping the flavor or salt of my chicken sandwich and fries might help balance things out after my initial impression, but it didn't. I kept drinking it because I was thirsty, and I didn't hate it, but I by no means found it anything more than tolerable. I guess at least it wasn't too sweet and technically I got some OJ in me, so it's not a total loss. You all see what I'm driving at here right in my review right? Wait, I can say it better. My point is that it doesn't remind me of any other orange creamsicle product I've had, and that's weird to me based on what it's made of. Maybe the lighter icedream just doesn't have the needed thickness to convey a good orange cream vibe. Who still has this on their to-do list? You have until June 2nd to give it a shot. Snow on Easter Monday was weird, but even weirder was how it was all melted by 4 pm >D I live a few states south of new england, tho, so I hope you guys had the same good fortune! The snow seemed like a late April Fools prank on the east coast. Snow, then rain, then completely warm and sunny. Wild. As for a vanilla and orange flavor, that seems like something that would work better for a soda than a shake. I thought it was called a Frosted Sunrise? When I first tasted it, it reminded me so much of what an original Orange Julius tasted like back in the day. Absolutely delicious. ....and I'm an idiot. review has been fixed. I just noticed Burger King has a frosted coke and a frosted Fanta. They are mixed with ice cream. I was wondering if you have tried either and have thoughts? WHOA! THe return of the Coke ICEE.... but now it's blended. Thanks for the tip, I will check it out. Well BK has an icee and a frosted (with ice cream) version of both. I feel the Fanta one was a direct response to the chick fil a sunrise.